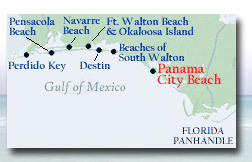 Palazzo Resort Condominium is located at the site of the former Island Breeze Motel (directly across from Boar’s Head Restaurant) on the west end of Panama City Beach. It is approximately 1 mile west of Highway 79 on Front Beach Road at 17281 Front Beach Road, Panama City Beach, Florida 32413. Unlike any other, Palazzo is low density, offering a limited 129 private residences, all of which take advantage of the gorgeous aquamarine views and tranquil sea breezes of the Gulf of Mexico. Closer than most Florida destinations lies 27 miles of soft white beaches, excellent diving, nightlife and unique activities for the entire family. Long synonymous with the term "Emerald Coast," Panama City Beach is now also home to several exclusive resort communities and enchanting new developments. Panama City Beach is a natural draw for both vacationers and permanent residence seeking warmth, sunshine and amusements within easy reach. Come see it for yourself, and prepare to be amazed. PRICES, PLANS, USES, DIMENSIONS, SPECIFICATIONS, MATERIALS, AMENITIES AND AVAILABILITY ARE SUBJECT TO CHANGE WITHOUT NOTICE. ORAL REPRESENTATIONS CANNOT BE RELIED UPON AS CORRECTLY STATING THE REPRESENTATIONS OF THE DEVELOPER. FOR CORRECT REPRESENTATION, REFERENCE SHOULD BE MADE TO THE DOCUMENTS REQUIRED BY SECTION 718.503, FLORIDA STATUTES, TO BE FURNISHED BY THE DEVELOPER TO A BUYER OR LESSEE. VOID WHERE PROHIBITED BY LAW OR WHERE THERE ARE OTHER QUALIFICATIONS TO ADVERTISING REAL PROPERTY. © 2006 Palazzo Condominiums. All rights reserved.